On a scale of one to ten (one being the best and ten the being worst), seam ripping to correct a wonky stitch or to correct the fitting of a work-in-progress gets an off-the-scale one million rating, as per annoying things that can happen while I’m sewing. I literally gnash my teeth in agony as I unravel stitch by stitch. Ah! my heart melted with immeasurable joy *insert delicious drips of sarcasm* the day I had to detach an invisible zip, when the zipper slider came off completely TWO minutes after I had attached said zip. So, in instances when I have to draft a pattern from scratch and I am not entirely sure what the finished work will look like, and I have only a limited amount of the desired fabric or if I am using expensive fabric, I prefer to err on the side of caution by first sewing a muslin (calico test garment) which is also called a toile, to sort of “test drive” the pattern. 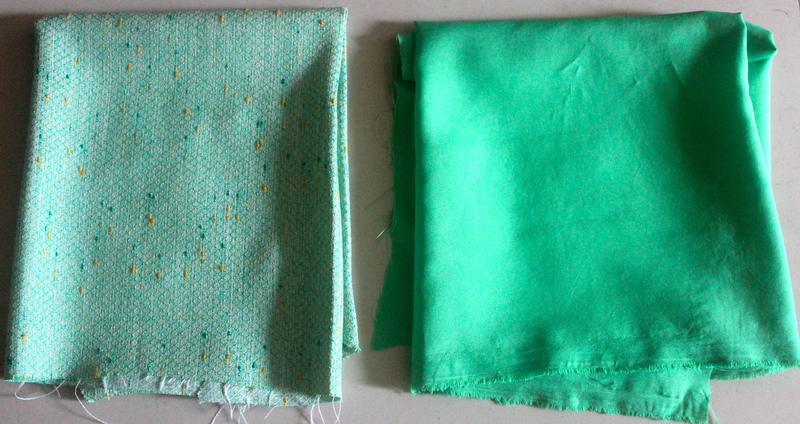 Above is the muslin and below is the final reproduction in the fashion fabric. Please excuse the creases, I wasn’t quite done with fittings. 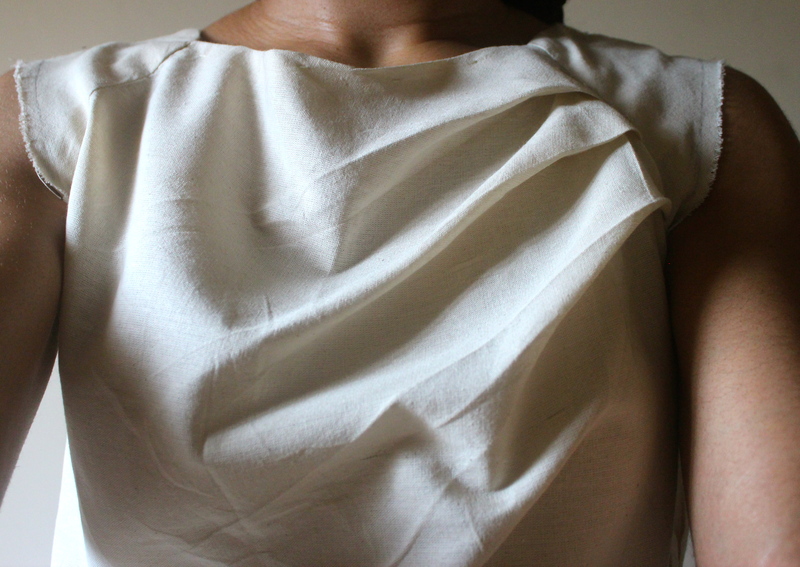 I created the design on the bodice by laying the fabric flat on my sewing table and pinning the folds in place. Muslins could be used as a metaphor for life. There are people who chose to live as a good example to others and they become role models. Other people become inspired by them, and try to do as they do, in their desire to replicate the role model’s success :-). Fabric sellers always say something along those lines, I promise you he’d have parroted the same words if I’d picked a 10 thread-count plain white fabric! The dress is fully lined with a lightweight polyester fabric and the bodice is connected to the skirt with a 1.5 inch waist band. I also converted the waist darts on the bodice to gathers so that they wouldn’t interfere with the folds. Just stumbled on ur blog.. Its captivating,am glued 100%..
On the bodice where did u transfer the shoulder and waist dart to ? 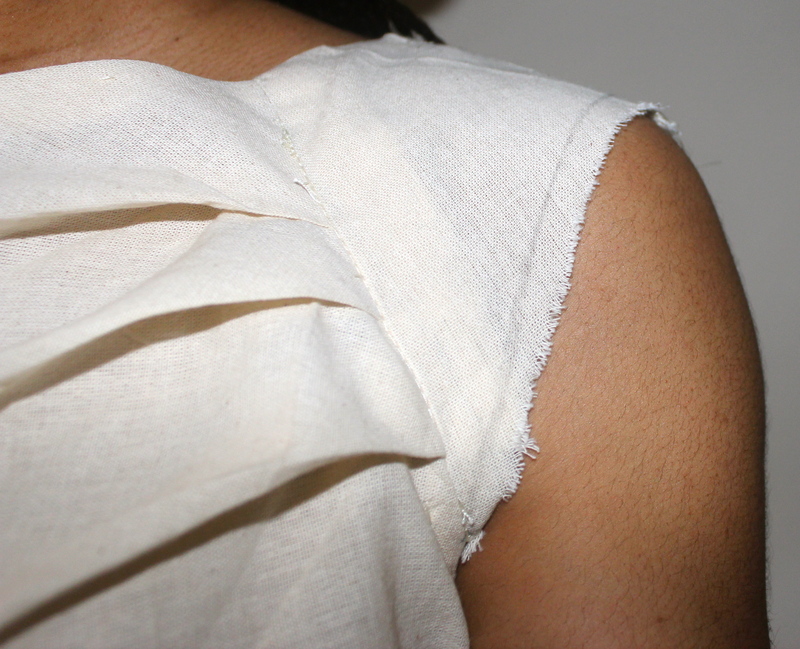 On the front bodice, the shoulder bust dart was transferred to the armscye and the waist dart was evenly eased into gathers. 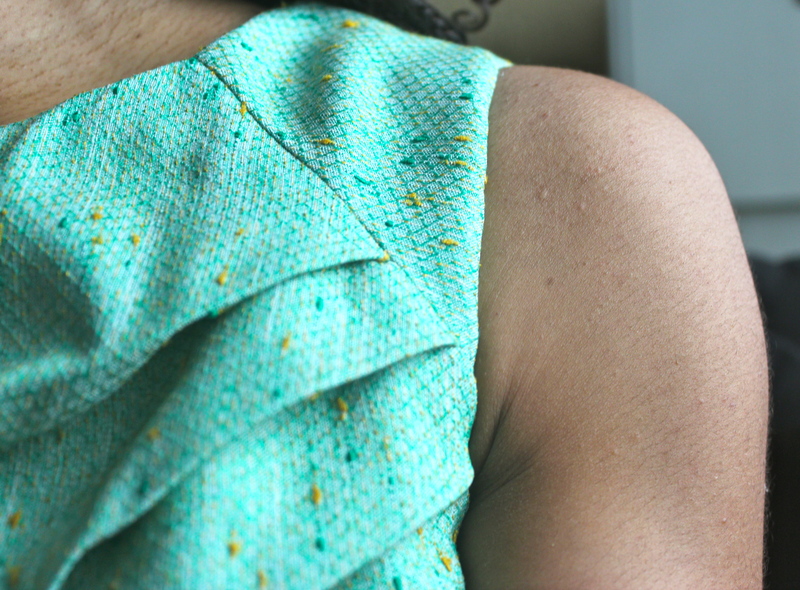 On the back bodice the short shoulder dart was transferred to the armhole. Just came across your blog through instagram. Always happy when I find people who I share things in common with. Just been on your blog for 5 minutes and I am already hooked. 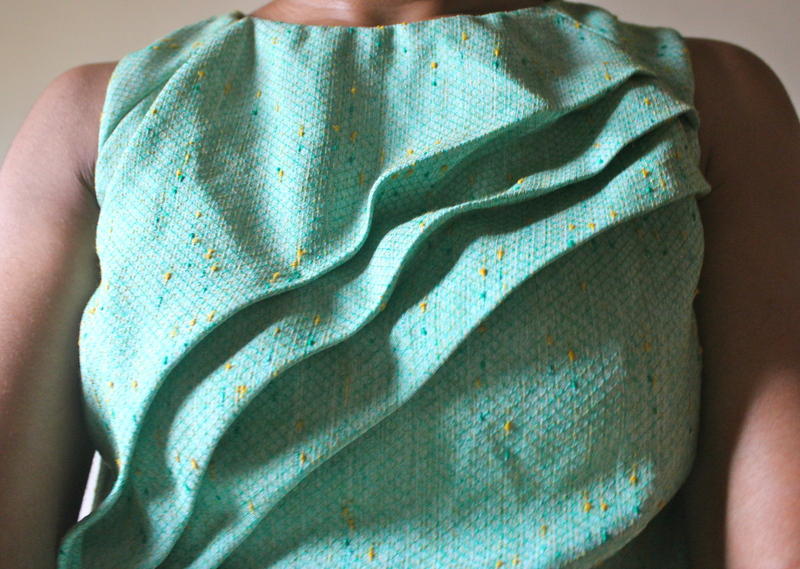 And Yes, it’s frustrating to loose stitches in order to correct a mistake, especially when sewing with soft fabrics. Ah, unraveling stitches can be so annoying, but we do learn from our mistakes. Ok, can we be best friends now? I can be the manager of your couture line. Thank you! That’s a really gorgeous dress. Well made! Coming from someone as talented as you, that’s a glowing compliment, thank you so much. Me too, I especially love how the waffled texture lends a hint of richness to it. Oh wow! That fabric looks soo classy. Tell us more about quality. I also love the style. Ah! The fabric is really nice, it has a waffled texture. 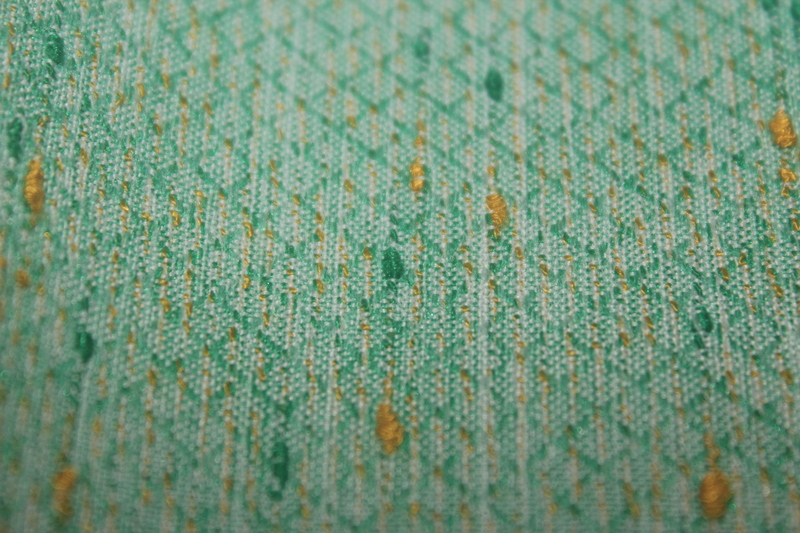 Both green and mustard yellow coloured yarns were woven and “bobbled” at intervals. I guess it’s a mix of cotton and something synthetic, perhaps polyester. Hehehe, click the heels of your ruby slippers three times and repeat “I want”. You might as well start selling your pieces on ETSY. I love everything you make! What a pretty dress! I never muslin my projects. I just get so excited I want to jump right in. I’ve been working with affordable/gifted fabrics so there won’t be too many tears if I ruin them lol. Lol, I also get giddy with excitement and curiosity for what the finished work will look like and I want to jump right in. But with expensive fabrics, ah! I try to curb my enthusiasm and make a muslin first. I actually have a 9-5. You’ve given me a brilliant idea for my next post on Sunday. You should, it’s such a useful skill, it will make you see clothes from a new and interesting perspective. Your lovely dress really suits you.